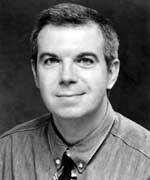 Christopher Moore, Chicago playwright/composer/lyricist, and director of the first commercial production, won a Joseph Jefferson Award for Best New Work of 1995 for POPE JOAN, which received its critically acclaimed original not-for-profit production at Bailiwick Repertory, Chicago in the spring of 1995. This followed his 1993 Joseph Jefferson Citation for Best New Work for his original musical, SON OF FIRE. Based on a real Chicago art world scandal of the '80s, SON OF FIRE premiered as the cornerstone work of Bailiwick's 1993 Gay and Lesbian Pride Series. Begun with a commitment to a four-week run, SON OF FIRE entertained and challenged Chicago audiences for the entire summer and was focused by the Chicago Sun-Times as one of the "hot summer musicals" of 1993. During the 1992-93 holiday season, his original musical THE PRINCE AND THE PAUPER, an adaptation of Mark Twain's novel, played at The Athenaeum Theatre in Chicago, where it was critically applauded and enjoyed by audiences of all ages. Earlier in 1992, Mr. Moore also composed original music for Brecht's ST. JOAN OF THE STOCKYARDS, which enjoyed a run at Bailiwick Repertory's mainstage. He was responsible for musical direction of that show as well. Mr. Moore's experience as a director in his own right complements the close, daily, hands-on association he has had with every stage director and musical director who has staged his work. It includes stage direction of the original hit production of JERKER at Bailiwick Repertory, Chicago, which ran for six months and re-vitalized the commercial viability of late-night gay theatre for that company. Moore also performed duties as musical director for ST. JOAN OF THE STOCKYARDS, the national non-union touring company of INTO THE WOODS (for which he received an "Ollie" for best musical direction from PERFORMINK, Chicago's theatre newspaper), and the original and encore productions of Bailiwick's ANIMAL FARM (for which he received a Jeff Citation Nomination for musical direction). Mr. Moore's theatre history in Chicago began in 1987. That year, he composed original music for Bailiwick's award-winning production of ANIMAL FARM, for which he received another Joseph Jefferson Citation nomination. Prior to that, he premiered three other original musicals with Palladium Productions in Chicago: GLAMOUR (an imagined musical meeting of Judy Garland, Marilyn Monroe and Vivien Leigh), COLORED LIGHTS (based on the life of playwright Tennessee Williams) and his bawdy Restoration parody, PRICK O'THE ROSE. Currently, Christopher is at work on ISABELITA: THE LAST PERON, a musical about Isabel Peron, President of Argentina 1974-1976. To that end, Mr. Moore spent part of early 1999 at Stanford University's Hoover Institution of Foreign Policy Research, and in Buenos Aires, Argentina. For those interested in more information about this project, visit www.isabelperon.com. Christopher Moore is a member of The Dramatists Guild and is represented by Susan Lersch, Lersch & Hartman, Chicago, Illinois.